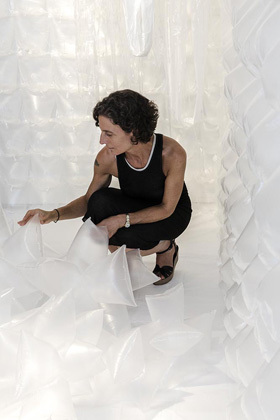 Ice land is a white monochrome and plastic installation embracing physical perception, interacting with the atmosphere of the architectural space inducing an everyday material to transcend itself. Shifting in perception. the viewer is seduced and intrigued while interacting with space, playing with contrasts such as empty/full, light/weight and silence/noise. The immaculate white invites one to immerse into a meditative state. 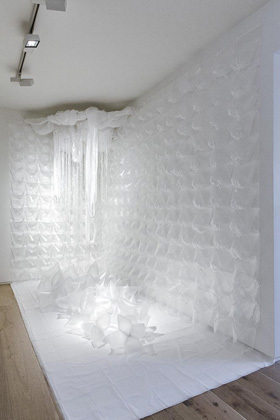 The entire wall is covered by freezer bags filled with my breath and hung with static energy.